Too far away for a sharp image but still lovely to see. The signs of spring are evident. Birds are moving, the days are getting longer even if we artificially shortened the morning hours, but I still needed to be reminded by the official first day of spring on the 20th. The last two weekends I have visited the Portage just to see what signs of life are emerging, however slowly. Robins are back and setting up territories in the woods as well as in my neighborhood. Red-Winged Blackbirds were audible on both visits to the Portage, if not displaying yet. Perhaps most exciting last Saturday was seeing my first Eastern Bluebird of the year, even if it was clear across the creek. I started imagining what it must have been like before all the House Sparrows and accompanying civilization…when I envision Bluebirds ruled. Then I started reading about how Bluebirds have made a come back of sorts, thanks to people putting up nest boxes, and they prefer open fields for habitat, so as the Portage loses more trees maybe I’ll see them a bit more often there. But for the most part I don’t live near Bluebird territory. Juncos have been photographically elusive for me this winter and last Saturday was no exception. I probably was looking at the last ones I’d see for a while. On the other hand I was surprised to see a Pine Siskin (below) but likely their occurrence in my yard this winter is part of a trend. There were more American Tree Sparrows and Song Sparrows hanging out by the thawed pond than anything else. There was open water last weekend, as opposed to the weekend before, but only one pair of Canada Geese and a Mallard or two. Otherwise, a White-Tailed Deer, and below her, what the frozen raging Des Plaines looked like two weekends ago, from a distance. My plan is to go back out tomorrow morning, when we are promised sunshine, to see if there are any more changes occurring. On my way to the train this morning, I noticed the Silver Maples are budding on the neighborhood streets. We are still flirting with a few overnight temperatures below freezing, but it looks like March will go out like a lamb. At least today, on Labor Day, I decided to be lazy by not getting up two hours before dawn so I could go birding. After meeting at the destination on Saturday, we canceled the walk due to thunderstorms looming in the wings. Even so, I had stayed back with another participant to get a handle on the layout of the trail setup when suddenly a crash of thunder and lightning striking right in front of us convinced us it was indeed time to leave. So yesterday I got up and decided I would not go far, but as long as it wasn’t raining or threatening to, I may as well try to see what I could find. I went to Ottawa Trail Woods and encountered some obstacles on the trail (above). It became even more evident that I was the only person to have traversed the river trail in a while as I managed to avoid only one of two spider webs strewn above the footpath. The first sign of life was the deer below. There were not a lot of birds. Or at least not a lot of species. But this time I got to see an Ovenbird for a few seconds although it was nearly the only warbler I saw. A dozen Common Grackles showed up in the trees right above my head. So much for dark backlit birds. Ottawa Trail is usually good for Thrushes and I was not entirely disappointed. At least I got to see this Gray-Cheeked long enough to photograph it. Early on I saw one Cedar Waxwing, but knew there was no such thing as a solitary Cedar Waxwing and on my way back on the trail I encountered at least sixty in the branches of one tree. Click on the upper righthand photo below if you don’t believe me. The bottomlands by the river were flooded from all the recent rain and I was able to relocate this Great Blue Heron after it flushed, when I surprised it by my walking the path even though at a considerable distance. Indigo Buntings were nearly unrecognizable. The one on the right was an up-and-coming male hiding from me at the Portage which was where I went next. The Portage still had a couple hummingbirds, perhaps the same ones I saw on Friday. Plenty of Jewelweed everywhere. A few years ago on a September day I saw what seemed like a hundred Ruby-Throated Hummers in one visit, all over the Jewelweed, but it was not repeated yesterday. If you look closely at the third image of the hummer you an see a little bit of red emerging on his young throat. By the time I got to the Portage it was closer to midday, the heat was becoming oppressive and I didn’t expect to see many birds. So I appreciate one Gray Catbird after hearing them but never catching even a glance at one Friday. In front of me on the trail, a baby Snapping Turtle. There were fewer dragonflies than last week. And I keep running into Eastern Commas that don’t want to pose correctly: or is it a Question Mark??? The Robins all seemed to be at Ottawa Trail yesterday with only a few at the Portage. I imagine it’s the same flock going back and forth. I came up with a new mantra this weekend, so I guess it’s only appropriate on Labor Day that I share it with you. I have been muttering “I have to stop working” for far longer than I want to recall. But I decided now my mantra should be, “I have to start writing.” I have been thinking about a book for the last several years. It changes every five minutes, but I think it’s finally starting to come together in my head because I found the first sentence yesterday. So it’s time to start writing it. Which may make my contributions to this page even more infrequent, I don’t know, it’s hard to imagine writing anything after working all day at a computer in an office. But by declaring my intentions sometimes I can force myself to get going so as not to risk eternal embarrassment. Thank you. I’m finally getting around to these pictures from the Memorial Day weekend. On Saturday morning I led the second walk at the Portage and the weather could not have been more different, shall we say – weather is becoming more than an idle topic for conversation lately as we keep having these 40 degree temperature swings in either direction – than the first walk which was rainy and chilly: this time we had plenty of sunshine and it was getting downright warm. We saw fewer species than the first group, as migration had progressed substantially in the two weeks between walks, but we had a good time. It was nice to get good looks at the Great Egret that seems to be back in the area. The Green Herons were absent this visit but I suspect all the herons go back and forth between the Portage, Ottawa Trail and the Des Plaines River, so I am sure they are still around. Red-Bellied Woodpeckers were a presence. We didn’t even hear a Downy Woodpecker which is really unusual as I always expect to see or hear at least four any time of year but they must have been very busy being quiet. It’s occurred to me that Song Sparrows are likely the only breeding sparrows at the Portage. Habitat requirements being what they are, I never thought this was odd but at the same time it seems there are a couple Chipping Sparrows that come back to my neighborhood every year so I wonder even about that. I guess it’s location, location, location. Early on we saw one of many Warbling Vireos we would hear constantly. And the Indigo Buntings did not disappoint. This was as close as I could get to a Northern Flicker. Two surprise birds below, neither of which were very visible, but I can now look forward to finding them again. Great Crested Flycatcher on the left, which we saw on our way out, and the camera just barely caught the Yellow-Billed Cuckoo on the right. I had pointed the camera lens at its curious-looking eyes peering out at me from where it was perched, and then it flew. I’ve heard cuckoos before at the Portage but have never seen one there until now. For all the warmth and midges swarms, there weren’t many swallows that morning. Below is a Tree Swallow taking a break. There were likely more Common Grackles than we saw, but this one was foraging in the bottomlands by the Des Plaines River. 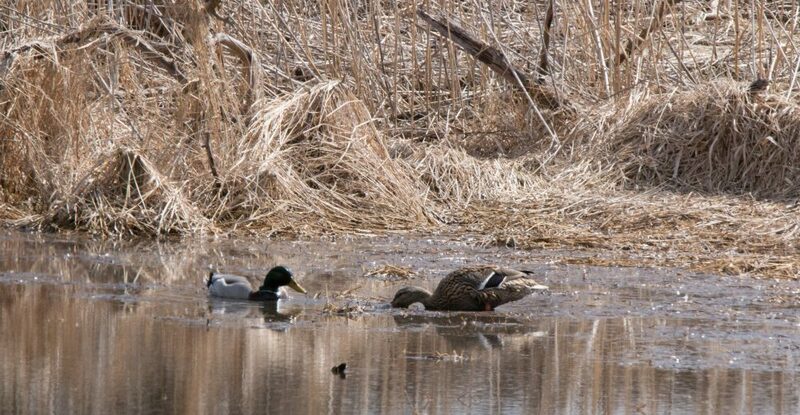 Two days later on Memorial Day, I decided to go birding early at McGinnis Slough and then swim in the Orland Park fitness center pool, my dream scenario ever since I’ve had to go to Orland while my usual swimming hole has been under remodeling. I’ve been driving by the Slough at night after work to go swimming, often seeing deer foraging in the grass before the days got longer and thus lighter at that hour, but now I had the entire day free and it was hot so a swim after birding seemed to be the perfect idea. I haven’t been able to swim well with my knee out of whack, but the pool has been excellent therapy. Below is a Widow Skimmer Dragonfly, which we also had at the Portage. A reminder it’s time to get ready for dragonfly identification again. It was nice to see families at McGinnis, like the Mallards below. Red-Winged Blackbirds are more numerous here. Two distinct silhouettes below: Double-Crested Cormorant and Turkey Vulture. Song Sparrows like McGinnis too. Waterfowl at McGinnis are usually distant and hard to see. Sometimes I take pictures and blow them up later to see what I was looking at, not that I ever get a very good image. Below the Mallard family are a couple pictures of a Great Blue Heron in flight and more Wood Ducks. I was surprised to not see any Great Egrets yet at McGinnis, as they can be everywhere. Likely they’ve been thrown off by the crazy weather too and I’m more confused than they are. I’m sure I’ll see them as we slide into summer. Here’s one more picture of a most accommodating Red-Bellied Woodpecker. I’ll be staying close to home, there’s much work to do in my yard. Not feeling up to rushing yet. Still savoring life in the slow lane.